This healthy Cranberry Pecan Greek Yogurt Chicken Salad is easy, tasty, and packed with protein. What I do say is, "Degustabox is an awesome subscription food box. I get it each month and the foods inside are a surprise. I always find great ingredients and snacks." 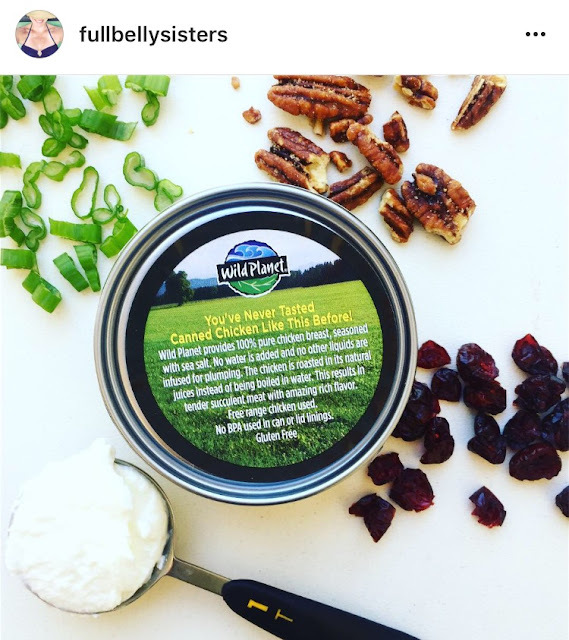 This month's discovery was a can of Wild Planet's Organic Roasted Chicken Breast. Now, I've had tuna a gazillion times in my life; I'd somehow never had canned chicken. This non-GMO-certified skinless, boneless chicken breast meat is roasted right in the can with only a touch of sea salt. And, of course, it's super convenient for a quick and healthy chicken salad. You don't even need to drain the can because it's 100% chicken in its own juice (other canned chicken may contain up to 40%, as well as processing additives). Just pop open the can, mix the chicken with some tasty ingredients and you've got a fab chicken salad! I was inspired by Life Currents' Cranberry Pecan Chicken Salad. I love the sweetness of the dried berries, plus the crunch of the nuts. I made some of my own additions, too, like using Greek yogurt instead of mayo. But this is the kind of recipe that you can certainly make your own! Combine all ingredients and mix well. Serve cold on crackers, on a lettuce wrap, or in an avocado! I had it as a super-quick, post workout lunch. Yum! I love avocados and usually eat as much as I serve. I love everything about this complete meal and I can have a whole half all to myself! Looks so perfect for my Low Carb style! Simplicity is always so nice when I know it tastes great! What a perfect lunch!! I have to check out this Degustabox!